While visiting York Pennsylvania luthier Chris Bluett (blu•ETTE), a gent comes into the luthiery with a violin in a paper bag. For sale. Chris makes and sells violins but does not buy unless made by him. The B-Team steps forward. I offer a slim stack of dollars for the shabby fiddle, and walk away a hopeful man. Tight unblemished top grain, casual adherence to scroll symmetry above the box, and matching pegs caught my eye. As I clamp down on refurbishment, it got better and better. Decades of grime gently removed, Behlen hide glue restoring separated back and top, this gem exposed promising pedigree. Labeled without origin, the top was definitely a better tonewood. Over a century ago with excellent materials, a craftsperson put this violin together with attention where it matters. Ready again for strings, I consult the foremost authority. With D’Addario Orchestral Strings CSR on speed dial, we come to the same conclusion. Premium strings for this promising centenarian. 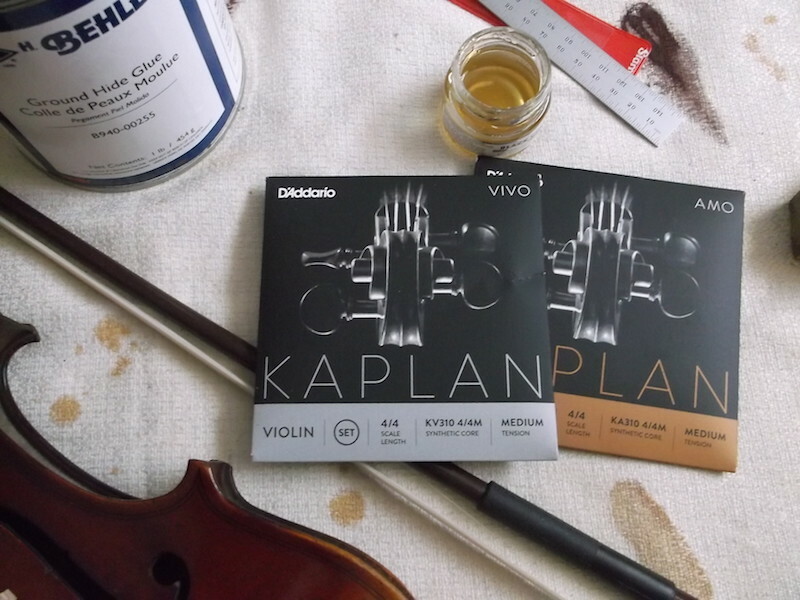 D’Addario Kaplan strings are selected. They feel good in the hand, as I string the violin. Almost silky, with superior peg end windings. Stretching “break-in” was minimal. The tone? Phenomenal! After Steve Fields gets used to the slightly different scale length of my set-up, his smile is never far as he runs through his favorites. 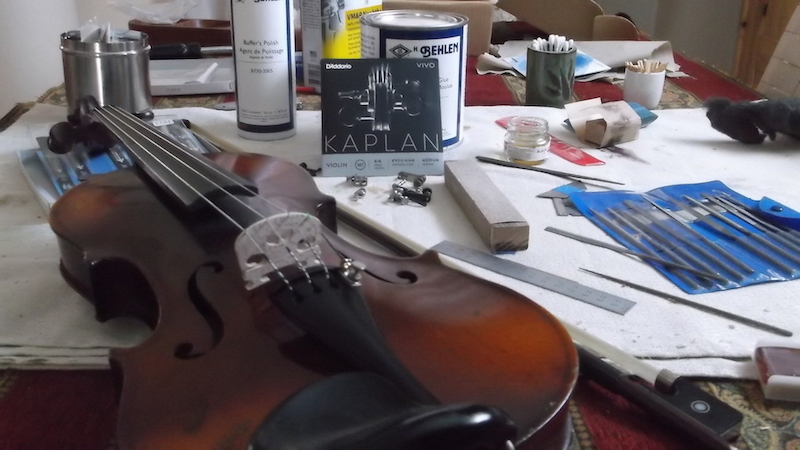 If I ever get this violin back from him, I may remove the D’Addario Kaplan Vivo set and try the D’Addario Kaplan Amo set. Can’t wait! This entry was posted in Music and tagged d'addario kaplan, jim sergovic luthier, steve fields violin.